20 years ago the exhibitions were filled with oxygen cylinders and now business is bigger and has progressed a lot. Most people know very little about the oxygen marketplace but it’s very much part of the ‘home-care’ marketplace although opportunities are emerging for retailers too. In America oxygen is big business and millions of them use oxygen, but it has high pressures on it due to the ‘competitive bidding’ programme, as Americans have the private healthcare system so there are many companies competing for low cost products. In the UK it isn’t as prominent but it’s definitely there and has grown. It’s a business that has gone from nothing to millions in just a few years. Over here the market is about delivering oxygen to patients at home. 70% of them are COPD patients and the numbers involved and the growth rate is huge and is thought to be the second biggest disability in the USA. The two main products are either static oxygen; which is produced from oxygen concentrators plugged into the mains, or ambulatory oxygen; necessary for patients who want to use oxygen outside of the home. This is achieved by the use of portable oxygen concentrators, transportable oxygen concentrators or devices such as home-filling, where the patient can fill gas cylinders from their static concentrator. A patient is diagnosed with a respiratory disease and either via a doctor or an oxygen assessment clinic their oxygen needs are assessed for a prescription. This prescription is sent to the contracted oxygen provider for that area of the country, of which there are 11 in England and Wales. At the moment the provision is mostly dominated by gas providers which is similar across Europe. This is due to the fact that traditionally the delivery model involved producing liquid oxygen, putting the gas into cylinders and transporting these and therefore gas companies were better equipped to deal with this process. 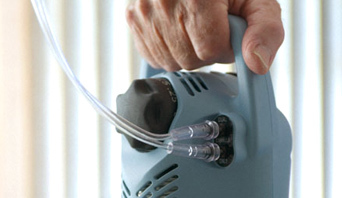 However oxygen concentrator technology has really taken off over the last few years in the US and has allowed healthcare companies to come into the marketplace and lower the price of the service considerably, as the need for delivery of cylinders and refilling these cylinders is being eradicated as now you can just buy a one-off product. Europe and the UK are slowly catching up with the idea. There are millions of people diagnosed with COPD around the world and 15% of these are prescribed oxygen. The number of COPD patients coming into the market is increasing and is expected to continue to increase for many more years. COPD patients are also increasingly being prescribed oxygen until the end of their life expectancy combined with the fact that COPD is being diagnosed earlier in life due to an increased awareness of the condition means that many more people will be requiring oxygen for longer periods of time. The demand for oxygen in the UK is being driven by the high levels of smoking. If you smoke for more than 30 years then it is likely that your lungs will become damaged. According to the UK government the number of people diagnosed with COPD is just the tip of the iceberg compared to people who actually have the disease. The NHS needs there to be more competition in order to bring down costs and invest in bringing the newest technology into the UK market. There are private companies coming through though such as Virgin Care who are involved in COPD management and pulmonary rehab management and their next logical step would be to also get involved in oxygen delivery as well. In Scotland the model has already evolved, which although was time-consuming and expensive in the short-term will help the NHS in Scotland long-term and there will be a £2 million saving on the pharmacy oxygen budget for them. They managed to link a manufacturer to a contractor and to the Scottish NHS in a three-way relationship via competitive quotes. Hopefully in the near future this will also happen in the NHS in England and Wales. It is hoped that there will also be opportunities for retailers too. There are already a small number of specialist retailers in the marketplace. OxygenWorldwide and it’s services can give expert advice and arrangement when travelling with oxygen. Your local provider cannot allow you to take your oxygen equipment abroad on a plane. As demand increases the pressure to produce equipment to hire or buy in order to travel abroad will also increase, as what happened in the US. It was the main driving force in the US for manufacturers to produce portable concentrators that were cheaper and lighter. Cylinders were too awkward to take abroad and airlines charge a fortune. This increasing demand and expectation will help to improve and cheapen the market over here as well. Consumers increasingly want lighter, longer-lasting, smaller oxygen concentrators and this will be the way forward for the marketplace. The main problem is battery life which is what happened with laptops and mobile phones. As the products become lighter and smaller then the marketplace will grow for retailers to sell them to their customers who want to get out and about more easily and to go abroad. The internet has also opened up the market and has encouraged transatlantic sales which has opened-up the eyes of the UK market to what else there is out there and in combination with an increase in private sales the Department of Health has responded positively. In the future it is expected that the marketplace will continue to open up and will take advantage of the new technology and delivery methods. Patients will still have static oxygen in their homes but will have an ambulatory device tailored to suit their needs. It is envisioned that in the future there could be oxygen monitors positioned on a patient’s ear or finger being programmed back through blue tooth technology, with a device on the hip which will then deliver the amount of oxygen they need at any point in time. Data can be fed and analysed to confirm that the patient is using it efficiently and that the oxygen purity is at the right levels. As with other markets, the private companies drive the technological advancements and increased demand helps to bring down costs and then these cheaper better products filter down into the public domain. In the meantime before the future gets here, if you are unhappy or feel restricted by the equipment that is currently available via your local supplier then take a look at a private company like OxygenWorldwide for portable oxygen concentrator hire across the world and not just for travelling abroad, costs have come down a lot recently and the technology available is more advanced. It’s worth a look and it’s an investment into your health and quality of life.